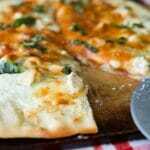 Lemon Chicken Ricotta Pizza is a white pizza made with a mixture of ricotta and mozzarella cheeses; then topped with boneless chicken in a lemon basil sauce. I haven’t made a new pizza or flatbread recipe since this one back in September so I figured it was about time to create a new variety. 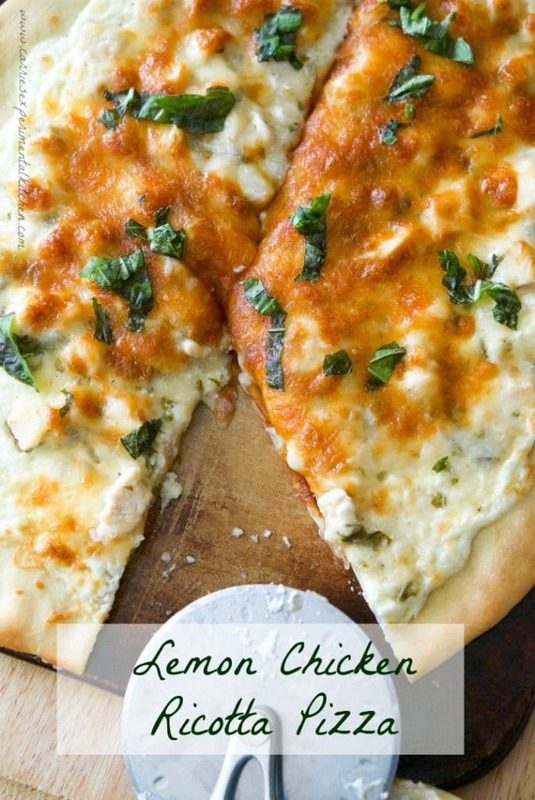 When I was deciding on what kind to make, I realized that you guys love lemon just as much as I do based on the posts you’ve been searching for so I created this Lemon Chicken Ricotta Pizza. Whenever I make homemade pizza at home, my family generally prefers pizza without red sauce for two reasons. One, as we get older the red sauce is a little too acidic and occasionally bother our stomachs. And two, why make thin crust pizza when we have the best pizza places all around us?! If we feel like having what we call “regular” pizza, I just pick up the phone and it’s ready in about 30 minutes. I guess living in NJ we’re spoiled that way! Anyway, back to this pizza. Friday’s are generally pizza night around here because it’s pretty quick and easy to make and if I have to, I can make it ahead of time, refrigerate; then heat up only the pieces we want to eat. With cheering season in full swing and we spend many nights at the basketball games or cheer competitions and my daughter is STARVING after she gets home. 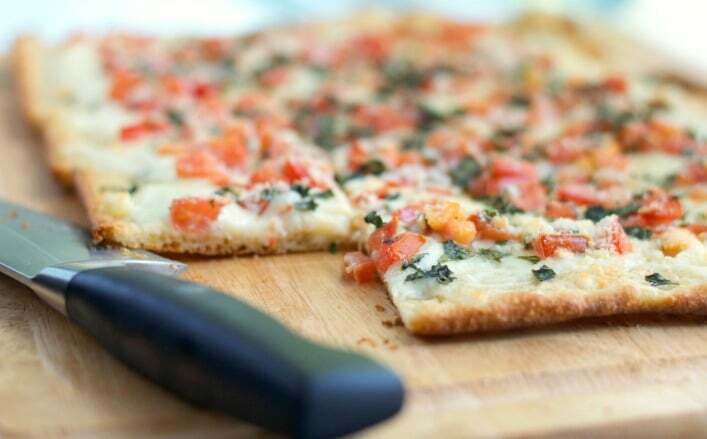 The pizza makes a great appetizer or snack too! 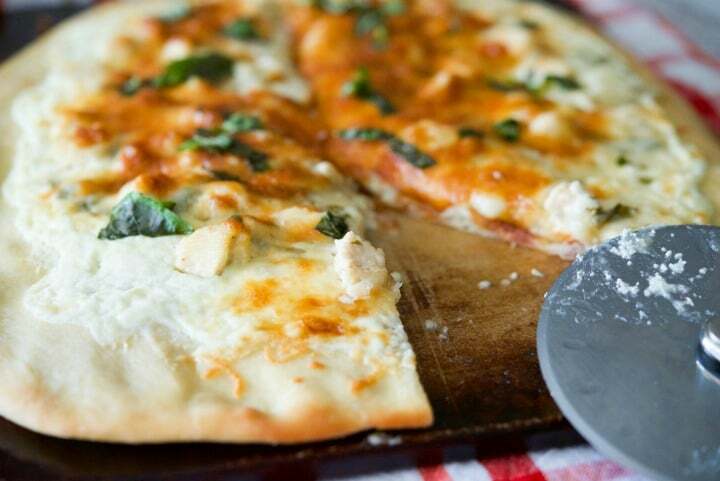 For this recipe you’ll need pizza dough, extra virgin olive oil, ricotta and mozzarella cheeses, boneless chicken breast, lemon, butter, chicken broth and basil. Like I mentioned earlier, we have good pizza places all over the place where I live so I don’t bother making my own dough. Instead I either purchase dough from my local pizza restaurant or I’ll buy the frozen kind at my local grocery store, but if you want to make it yourself, you can try this recipe for starters. To lighten up my recipe a bit, I also used fat free ricotta and part skim shredded mozzarella cheeses, but you could use regular cheeses or even the Four Cheese Italian Blend. Hey, I have to cut back where I can! 😉 Start by making sure your pizza dough is room temperature. If it’s cold, it will be difficult to stretch out. First, I make the chicken mixture by cutting it in small pieces; then sautéing the chicken in a little butter until it’s cooked through. Next, I add a bit of flour to help thicken the sauce before adding the chicken broth, lemon juice and fresh basil. Remove from the heat and set aside while you stretch out the dough. I like to use either a seasoned pizza stone or an older sheet pan so the crust gets crisper. 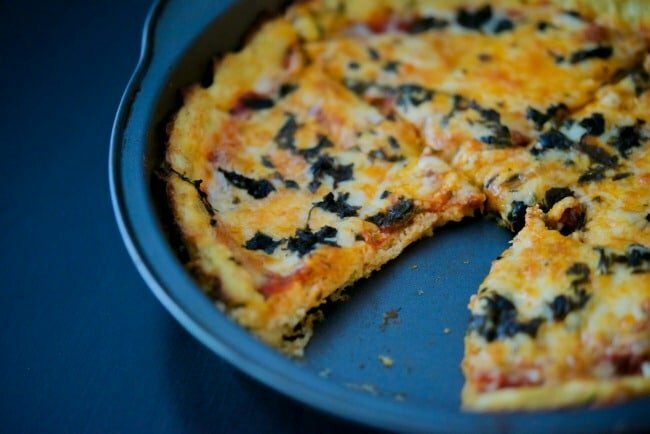 Nonstick pans tend to cause the dough to stay on the soft side and the crust isn’t as crispy. Also, when I say “seasoned pizza stone”, I mean one that has been placed in the oven with some oil on it; then baked for about 30 minutes. Do not use soap to wash the stone, only water. This helps food not stick so badly to the stone; especially for the first few times of use. Whichever you use, coat with a thin layer of olive oil before stretching the dough to fit the diameter. 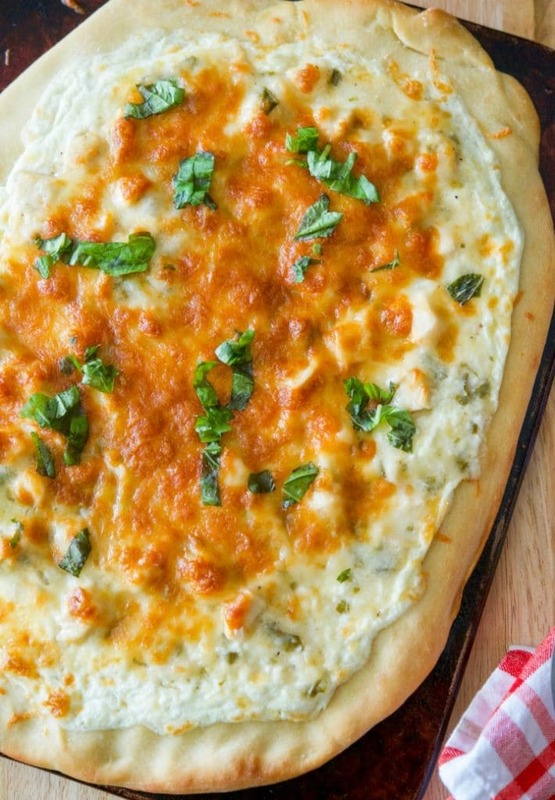 Once the dough is stretched, combine the ricotta cheese with some of the shredded cheese and place on top of the dough leaving a border for the crust around the perimeter. Add the cooked chicken mixture; then sprinkle the remaining shredded cheese on top. Bake in a preheated 425° F oven for 15-20 minutes or until the edges of the crust have browned and the cheese is hot and bubbling. 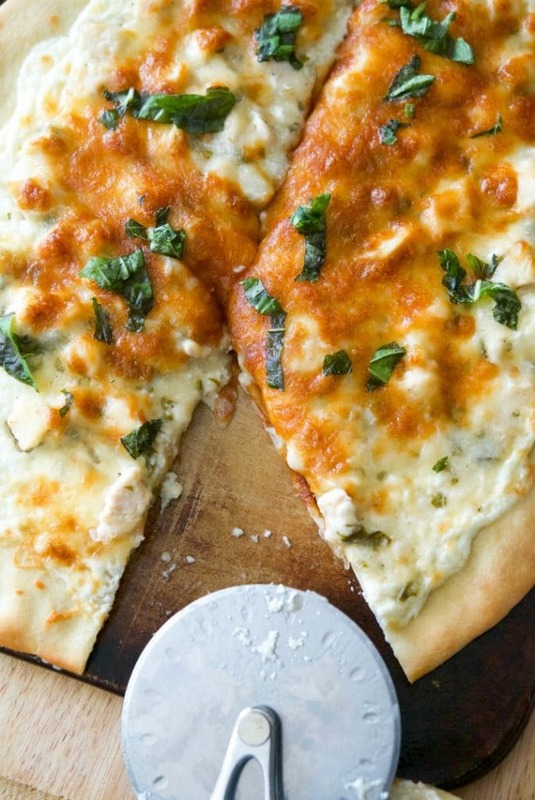 We loved this Lemon Chicken Ricotta Pizza and it really wasn’t too lemony (according to my daughter who doesn’t care for lemon things all of a sudden…teenagers!). In fact, it was delicious and had a ton of flavor. We used a pizza cutter to slice the pizza and got 10 slices. If there are any slices left, wrap them in plastic wrap after fully cooled; then place in a freezer bag and pop them in the freezer for quick, last minute dinners or an after school snack. ~Enjoy! Melt the butter in a small pan over medium heat; then add the chicken and cook through. Add the flour; then stir in the lemon juice and chicken broth and 1 tbsp. of the basil until the sauce thickens. Stretch out room temperature pizza dough with the oil until it fits your stone or sheet pan. 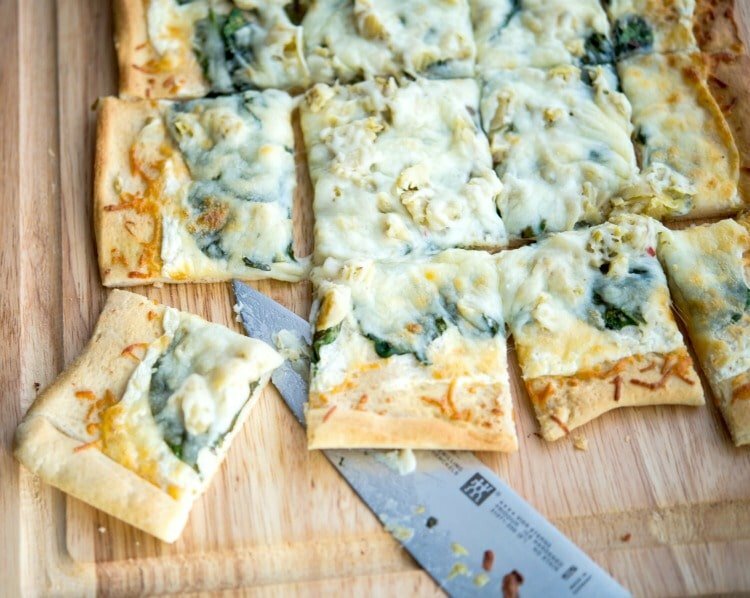 Combine the ricotta cheese with 1/2 cup of the shredded cheese and place on top of the dough leaving a border around the edge for the crust. Place the chicken mixture on top of the cheese; then top with the remaining shredded cheese and chopped basil. 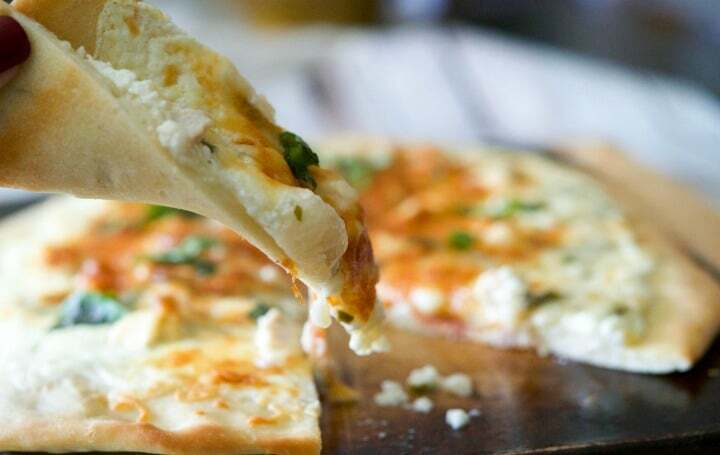 Bake for 15-20 minutes until the edges brown and the cheese is hot and bubbly. 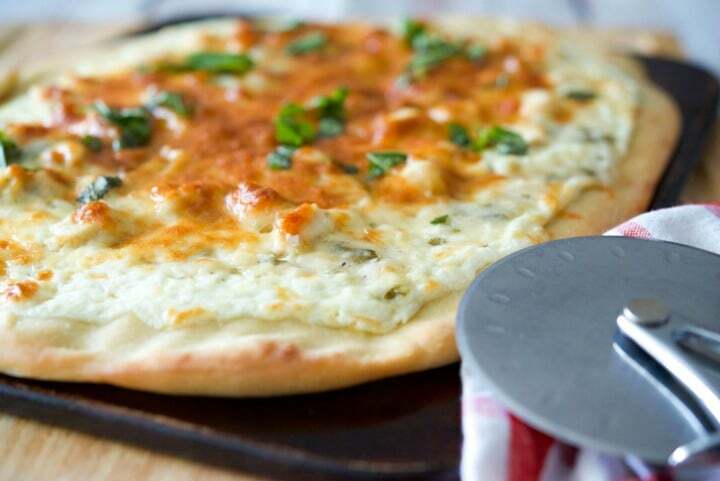 *I used fat free and part skim cheeses in this recipe to reduce caloric/fat intake. You may substitute whole milk or other varieties instead.